LightLane - Concept becomes reality! 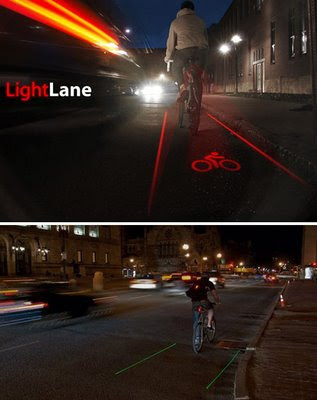 Back in January I posted about a concept for a bike lane that's projected from your bike to the street, a novel and excellent idea for how a cyclist can create a safe space in which to ride. That concept is shown in the top image - and lo and behold, it's on its way to becoming a real product! The bottom image is the LightLane functional prototype - and I, for one, am impressed! I'd expressed some doubts in the comments of the original post, involving the brightness of the projection and battery life, but I see that some good choices have been made: the prototype eschews the "bike lane" logo and instead focuses on the two side lines, each of which is projected with its own laser. Also, the low-energy red light has been replaced with high-energy, eye-catching green - and anyone who's seen a green laser knows, they're tough to ignore! However, the battery life remains low - the site claims a 3-hour runtime, which means it's probably only a few trips per charge. But the designers also make the excellent point that the product's performance "is best when lighting conditions are at their worst, improving safety in the most critical situations." Very true - and this continues to be a very worthy endeavor. Bravo! Taking the principles of product design to a morbid and creepy place, New Point Knives makes kitchen knives that purport to be "stab-proof" - the blade can still cut veggies and meat, but the blunt point is designed to foil any... uh, fouler play. Of course, the edge is still dangerous - but it seems logically true that the edge is necessary, while the point is generally only useful for non-culinary purposes. It's an interesting notion, as is the thought exercise of imagining which kinds of users would actually decide that they need to buy these instead of normal knives. And the tagline? Just stupefying: "Designed for cooking - nothing more - nothing less." ...And hey - this is Unpressable Buttons' 400th post! Thanks for reading, everyone! Today's item is a little out of my realm of expertise, but I'll take a shot at it: flats versus heels! That is, which is more usable - and I've got to say, there are some surprising arguments to be made in this case. At first blush, heels seem to be strictly cosmetic and fashion-motivated. But my lovely wife points out that there's more to it; they apparently reshape a woman's legs to look more toned, and alter the overall posture to become more attractive and confident, and these body cues affect the psychology of both the wearer and viewer. A powerful and useful tool indeed, but as any girl - or guy who's been out with a girl - will also tell ya, most of'em hurt to wear for a long time. That's where flats come in - and to take advantage of this, a company named Rollasole (thanks, Mary!) is beginning to offer flats in vending machines at nightclubs, like in the photo. The idea? Buy flats for the walk home after the heels have already done their job impressing people at the club. So, as far as the usability judgment between the two, I'll have to call it a draw - they both really do have their own times and purposes! I love my iPhone, but every once in a while I find a little snag - and this time, that snag is quite literal. 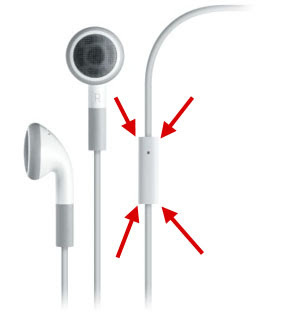 The headset that comes with the iPhone has a small microphone-and-button thingy on the cord, the use of which is extremely well integrated into the phone and audio player functions. However, the physical shape of that little bulge turns out to be problematic; it has sharp edges on the top and bottom (see the angry red arrows) which love nothing more than to snag and catch on shirt collars and jacket zippers. Since I tend to use the headset when I'm commuting by train and bus - and wearing a jacket and collared shirt - this has gotten pretty annoying. A pill-shaped mic-and-button unit would solve the whole problem. I know Apple is a stickler for industrial design, but can a user get a radius? Please? There are certain niche users in the world who, while not great in number, have a great need for real and usable design solutions to their problems. The DeafBlind Communicator is an excellent example - it's a well-designed tool that makes communication possible for those who are both deaf and blind. 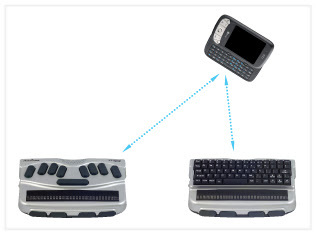 The system splits into two parts, one of which is handed to the person with whom the owner wants to communicate; that person uses a standard qwerty keyboard, visual display, and audio output, while the deaf-blind user has a specialized keyboard and Braille display. The two parts of the system communicate with each other via Bluetooth. 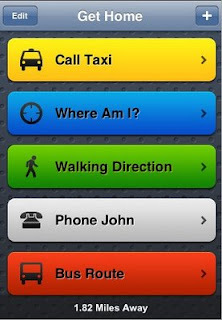 It's a simple and effective way to give each party the communication tools they need, quickly and easily - and with this good design, deafblind users can enjoy a little more freedom in life. 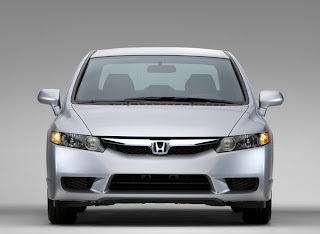 I've posted before about the peculiar rules by which my Honda Civic operates, and last weekend I added another inexplicably-designed behavior to the list. I had turned off the car while the moonroof was in the process of powering itself closed. To its credit, the moonroof continued to close even after I turned the car was off - this makes sense, as it was dutifully completing the command that I'd given which wasn't yet done. However, when one of my passengers opened his door - a rear door, no less - it stopped. Huh? Why should the car cancel a command by the driver - "moonroof, close!" - because of a totally unrelated action by the passenger? It's bewildering, yes - but even worse, I feel like my authority as the driver and owner of the vehicle has been usurped. Just like I have the power to give my rear passengers the child-locked-window treatment if I feel like it (heh heh), I should have my commands to the car be obeyed despite their interference - intentional, or as in this case, not. Poor design that causes inconvenience is one thing, but when it feels like it gives the product a mind of its own, complete with shifting loyalties, then it's a real problem! Three.Sentenc.es - A manifesto, maybe misguided? Three.sentenc.es identifies a problem with which I certainly agree: "E-mail takes too long to respond to, resulting in continuous inbox overflow for those who receive a lot of it." However, their suggestion to make email more usable is a bit Draconian: all emails, "regardless of recipient or subject, will be three sentences or less." My first thought, being an engineer, is that many of my emails require a thoroughness that can't be accomplished in three sentences; oversimplifying things or omitting relevant details would be disastrous. And on the personal front, there are many people with whom I have "long-form" correspondence: multiple-paragraph life updates sent every month or two, to which a three-sentence response would be downright insulting! Then there are emails with details about travel, events, instructions, announcements, updates... Hmm. The manifesto itself invokes text messages as an example of the short-form communication it's encouraging; the other obvious example is (ugh) Twitter. But both these tools tend to get used for inane, meaningless, OMG LOL, non-communication. Email, which can be what it needs to be for whatever it needs to be, is how things get done. Don't destroy the tool to relieve inbox overload - sure, be a courteous emailer, but when long ones are the most usable, don't skimp! Let's try an analogy: disposable plastic grocery bags are to fabric reusable grocery bags as disposable coffee to-go trays are to the Tota Coffee Carrier. Offered from Ponoko in either gray felt (oooh) or white styrene (meh), this simple laser-cut flat-sheet product folds into a suitcase-style carrier for two cups of coffee. 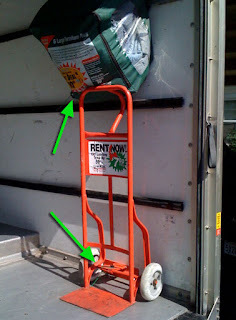 It gets a few things right, like the low-cost simplicity of the production, the luxurious feel of the experience (as anyone who uses reusable grocery bags knows), and most compellingly in my opinion, the "safe" balance of holding the coffee cups from the top rather than grasping them, teetering, from the bottom. But there are some shortcomings, too: my first concern is that the coffee cup must be exactly the right size to fit snugly into the hole, or it will be held by the attachment of the lid to the cup - not a safe situation! 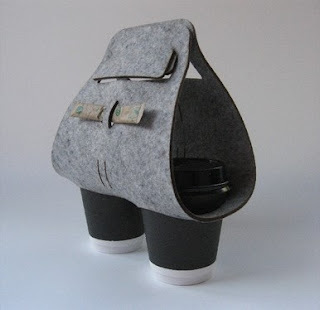 Second, it includes a looped carrier for sugar packets - but only the long'n'skinny ones, and nothing for creamer. Still, for the user who finds himself in exactly the right situation for this product, it would be a joy to use. 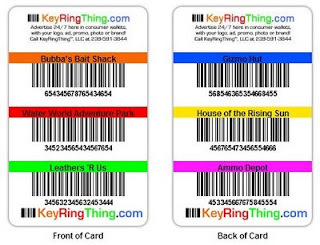 For those who are keeping their wallet on a diet, KeyRingThing offers a simple and useful service: putting all those barcode-based loyalty cards you carry onto a single, six-in-one card for your wallet. It's a fine idea, and one that has existed before, in DIY form and as a similar web-based service. But why not go all the way, and save all your cards as bits instead of atoms, on your phone? Take a closeup phonecam photo of each card and save them in a dedicated album - and chances are, the barcode scanner will be able to read them right off the phone's screen! Gmail Labs' latest addition is a simple one, but it definitely has the potential to save a little time. Inbox Preview shows a static preview of the inbox while the full Gmail page is loading. Why is this helpful? Well, for those on slow connections (like cellular modems, especially in non-3G coverage areas), the full Gmail page can take its sweet time to get up and running. And since it's totally possible that the user is really only interested in seeing if there are any new messages, the preview could answer that question quite a bit more quickly. Sure, it's only a pretty specific situation where this feature is useful - but if you're that person in that situation, you'll appreciate the time-saver!